Arlington National Cemetery is a United States military cemetery in Arlington County, Virginia, across the Potomac River from Washington, D.C., in whose 624 acres (253 ha) the dead of the nation's conflicts have been buried, beginning with the Civil War, as well as reinterred dead from earlier wars. The United States Department of the Army, a component of the United States Department of Defense (DoD), controls the cemetery. The national cemetery was established during the Civil War on the grounds of Arlington House, which had been the estate of Confederate general Robert E Lee's wife Mary Anna Custis Lee (a great-granddaughter of Martha Washington). The Cemetery, along with Arlington House, Memorial Drive, the Hemicycle, and the Arlington Memorial Bridge, form the Arlington National Cemetery Historic District, listed on the National Register of Historic Places in April 2014. This place is just beautiful. You can truly feel the respect for our nation's deceased, and there is a stunning peace and quiet there. The grounds are well-maintained, and there's a good tour you can take that is enjoyable and interesting. The scenery is actually very nice, with lovely trees and rolling hills. 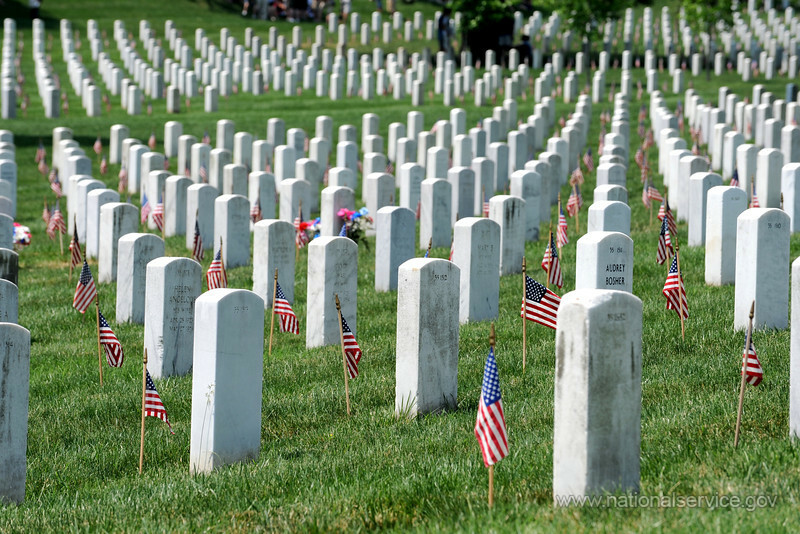 However, something very important to keep in mind for when you go is that you go on a day when the weather is cool - because there's not abundant shade, it is really hard to enjoy Arlington National Cemetery when it's blistering hot. My mom is buried on top of my dad in section 67 grave 1307. I love going to this beautiful place except on Memorial Days. It's a really nice sight on Memorial Day with all the people and the flags on our loved ones graves, but the traffic is hard to deal with. Especially with Rolling Thunder and all the other visitors. Don't get me wrong, the amount of bikes are an amazing sight and the loved ones are too. But I would rather visit mom and dad's stone in a little more peaceful setting. It is breath taking to see all of the men and women for so many years who have fought and died for this great country. The cemetery is so big, that it take a long time to walk through the whole thing. It was about fifteen minutes in to get to the tomb of unknown soldier where there is a guard 24 hours a day, seven days a week protecting it. The passing of the guard is very interesting to see and has a lot of meaning. Well manicured grounds. The security staff are present and respectful. My visit was on presidents day (Respectfully done so). You would be surprised to know that I was the only person this misty morning for about 15 minutes. The tour groups were present but the cemetery is so big you wouldn't know they were there. Visit the house at the top of the hill and be amazed at the views.